Care should be taken when swimming in the oceans around South Africa. 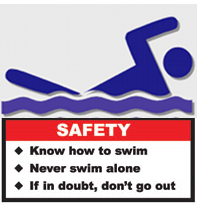 Treacherous currents and high waves can drag swimmers into dangerous situations, sometimes followed by fatal drowning. There is also a risk of shark attacks. Therefore it is strongly advised to only swim where lifeguards are operating, and to avoid desolate and unguarded beaches. Drowning or near drowning frequently happens in South Africa's coastal areas. Tidal currents and unexpectedly high waves do happen, together with ever moving rip currents. These currents come to live in a trench between sandbars, which can be described as a powerful, narrow channel full of fast-moving water running perpendicular to the beach, out into the ocean. Rip currents can be located by trained beach lifeguards while non-experienced swimmers can mostly not discern them. 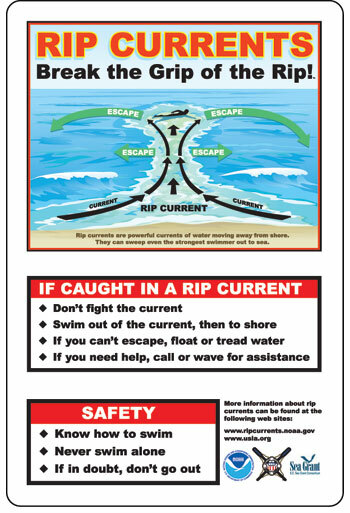 A swimmer caught in a rip current should not attempt to swim back to shore directly against the current. This would result in exhaustion and drowning. The swimmer should remain calm and swim parallel to the shore until he or she is outside of the current. Then the swimmer can swim at a leisurely pace, in a diagonal direction, away from the rip but back to shore." Be aware that the entire Wild Coast is subject to intense shark activity. There's two damn good reasons why indigenous inhabitants of the coast historically avoided the water, unlike the heavy coastal utilization up the African east coast: (1) rip currents prevailing in an area where the coastal shelf plunges abruptly, and very close to land; and (2) sharks. Port St Johns has acquired the miserable reputation of a totally-out-of-proportion share of global shark attacks: it is THE hotspot. But don't be fooled: the entire Wild Coast shares the same features. Cape Town styled shark-spotting won't work (water's too murky; different types of shark); and KZN-style shark nets won't work (rip currents; besides sound conservation reasons). Most attacks have been on surfers or lifeguards: apparently the boards and lifeguard rafts resemble prey (seals - there are seals around here? ), and the only way to know is to take a bite - a big bite. But that little comfort zone got blown-out in the last attack, which was in a gentle little estuary stream, with lots of swimmers around: the victim (mauled and churned into blood) was in knee-deep water. That's right: knee-deep, out of the surf. What's to do? Stay ankle deep, hit the pools, or just admire the view and the environment. The sea is really not for swimming.